Chester members were enjoying the sunshine at our monthly social gathering last Sunday when there was a fly past by a spectacular plane, an Airbus Beluga. We would like to think that the pilot and crew were merely flying over to watch croquet in action on National Croquet Day but in reality they were on a routine flight from near- by Broughton. Perhaps we should explain: Airbus makes large commercial planes, notably the A320 and A380 series. The wings are made in Broughton but the final planes are assembled in Toulouse or Hamburg. Can’t stick the wings in the post so what do you do? 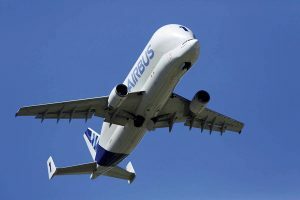 The answer is an ingenious modification of an A 300 into the Airbus Beluga which can transport the wings in its “belly”. So if you see an unusually large plane fly over your croquet club, you’ll now know what it is. PS: An even bigger Beluga is under development to transport a pair of A 350 wings in one go. The wings of the A380, which are too large for even the Beluga XL, have to go by sea. Our thanks to Airbus for providing the superb image and the accurate technical data.